Whether it happens all at once or gradually over time, spiritual awakening is an experience that may be accompanied by great insight, ecstatic bliss, or a mystical infusion of light, love, and vision. But it can be an overwhelming experience, too, leaving those to whom it’s occurred searching for answers and understanding. Written by a transpersonal psychologist and non-dual teacher, this book will help you understand the phenomenon of spiritual awakening, and provide guidance and support for you on your spiritual journey. At the heart of most spiritual traditions is the understanding that we are one with all of existence. This realization, also known as spiritual awakening or spiritual emergence, can occur spontaneously, after years of spiritual practice, or through many other portals. Although awakening is often considered a purely positive experience, many people are not prepared for the ramifications of such a life-altering event. When your perception of yourself and reality has been altered, you may find yourself with more questions than answers. Where can you turn? 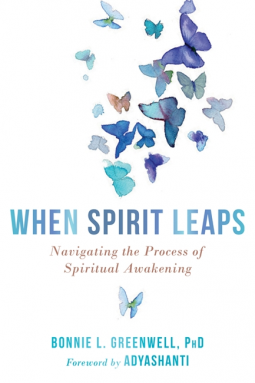 Based on over thirty years of case studies, as well as the author’s own experiences, When Spirit Leaps explores the why and what of spiritual awakening, revealing how this phenomenon occurs across all traditions, and exploring the various ways it can happen. Including discussions on kundalini energy, meditation, yoga and qigong, breathwork, near-death experiences, and much more, this inspirational book offers companionship and practical solutions to common challenges along the spiritual path of awakening. With this book as your guide, you’ll gain a deep understanding of the process and different portals of awakening, and find comfort and support in the real-life stories of those who have experienced this shift in consciousness and faced its challenges. Most importantly, you’ll learn how you can embody this awakening and live joyfully and effectively without attachment to a personal sense of self, but as the oneness with all that is your true nature. No matter where you are on your spiritual journey, this book will help you along the way. BONNIE GREENWELL, Ph.D. is a teacher in the lineage of the modern non-dual wisdom teacher Adyashanti, and a transpersonal psychologist who has dedicated her work to the support of people in the spiritual emergence process. She is the author of “Energies of Transformation: A Guide to the Kundalini Process”, and “The Kundalini Guide” the editor of Adyashanti’s book “Emptiness Dancing” and contributor to the anthology “Kundalini Rising”. After years of working as a transpersonal therapist, she established Shanti River Center in Ashland, OR. to provide non-dual and transpersonal education. With a broad background in eastern and western traditions, and a long personal history of awakening moments, she has trained therapists and spiritual teachers internationally to work effectively with the dynamics of awakening and the embodiment of Self-realization.